I’ve been receiving quite a lot of queries on business registration abroad. Thus, this topic is for those living abroad either Filipino citizen, resident or foreigner who wanted to put up business in the Philippines. Anyhow, our company helps locals, Filipinos abroad and foreigners to start their business in the Philippines. We take note of your requirements and recommend the best corporate structure to utilize and give you insights on the advantages and disadvantages of the various entities available. Having problem? Talk to us. We can help and assist you, please don’t hesitate to contact us. We will be more than glad to hear from you and we will respond to your request as soon as we can. I am a Filipino living abroad and I would like to setup a company in the Philippines. I intend to sell imported goods to local people. What sort of company structure would suit us best? Generally, Filipino living abroad or a permanent resident of a foreign land cannot put up a single proprietorship business sanctioned by Department of Trade and Industry (DTI). Your option is to put-up a domestic corporation and register the business with Securities & Exchange Commission (SEC). Do I need a Philippine office for my company/business ? Yes, it’s a requirement for business registration and incorporation. Can we use virtual office as our registered address for our company incorporation? Yes, virtual office is acceptable for this purpose. A virtual office is an office located in the Philippines. I am a foreigner and I would like to setup a company in the Philippines. Our intention is to sell technology services to local people. What sort of company structure would suit us best? If more than 30% of your sale/service is derived from Philippine market, then your company is considered a domestic market enterprise. As such, generally, foreigners may own only up to 40% of the company. How long does it take to incorporate a company in the Philippines? Normally, it takes at least 45 days, if all documents needed are forwarded as early as needed. This is on the assumption that no government delays will occur in the process such as system downtime and the like. I am a foreigner. Do I really need to put in US$200,000 to incorporate a company in the Philippines? Yes, Under usual circumstances, you really need to remit USD200,000 into a Philippines bank account as part of the process to incorporate your company in the Philippines. The money can be withdrawn after the release of the SEC certificate. If your company is considered as an export market enterprise (i.e. more than 60% of your revenue or output is exported from the Philippines), then you are not required to put up $200,000.00 as paid up capital. The minimum paid up capital for an export market enterprise is only Php5,000.00. However, if your company is considered as a domestic market enterprise, and subject to the foreign investment negative list, then you are required to invest US$200,000 for you to be able to set up a 100% foreign owned company. Please take note though that foreigners are generally not allowed to engage in retail business (as this is reserved for Filipinos), unless they are investing $2.5 million. What is the estimate cost to maintain a company here in the Philippine? The cost really depends on the nature of business, please consider as well the minimum wage, taxes and other government compliance for your additional operational expenses. What is the corporate tax rate in the Philippines? Domestic corporations (as well as partnership other than a general professional partnership) are taxed on their income from all sources (whether within or without the Philippines. Resident Foreign Corporations are taxed on their income from sources within the Philippines. Both are taxed at 30% on taxable income (revenue less allowable deductions). Non-resident foreign corporations are taxed at 30% at source (final withholding tax). The tax rate may be reduced if there is a tax treaty between the Philippines and the country where the NRFC is registered. Are there any tax when we repatriate our investment out of Philippines? Yes, there will only be a 10% tax on the fund you declared to repatriate out of the country. Are there any foreign currency exchange control when we repatriate our profit? No, but there will be a 10% withholding tax for all outgoing funds declared as repatriation. How do I determine the actual amount of money I need to remit to start a company? It depends on your business need. Of course, take note of the 25%-25% rule which states that at least 25% of the authorized capital stock must be subscribed and 25% of the subscribed capital stock must be paid up. There are areas of investments, though, that the law provides for a minimum paid up capital (e.g. recruitment agencies, schools). In the Philippines, most people usually break the entire process into 2 parts. Part 1 is to get your company name approved and registered with SEC. This process can be completed within 10 working days. The 2nd part is to get your company registered with the local government unit having and Bureau of Internal Revenue exercising jurisdiction over the place of business. This process will take about 3 – 5 weeks. The Philippine Economic Zone Authority (PEZA) is attached to the Department of Trade and Industry and is tasked to promote investments, extend assistance, register, grant incentives to and facilitate the business operations of investors in export-oriented manufacturing and service facilities inside selected areas throughout the country proclaimed by the President of the Philippines as PEZA Special Economic Zones. What are the benefits of getting a PEZA status? Income Tax Holiday (ITH) – 100% exemption from corporate income tax. Upon expiry of the Income Tax Holiday – 5% Special Tax on Gross Income and excemption from all national and local taxes (“Gross Income” refers to gross sales or gross revenues derived from the registered activity , net of sales discounts, sales returns and allowances and minus cost of sales or direct costs but before any deduction is made for administrative expenses or incidental losses during a given taxable period). Tax and duty free importation of raw materials, capital equipment, machineries and spare parts. Exemption from wharfage dues and export tax, impost or fees. VAT zero-rating of local purchases subject to compliance with BIR and PEZA requirements. Exemption from payment of any and all local government imposts, fees, licenses or taxes. However, while under Income Tax Holiday, no exemption from real estate tax, but machineries installed and operated in the economic zone for manufacturing, processing or for industrial purposes shall be exempt from real estate taxes for the first three (3) years of operation of such machineries. Production equipment not attached to real estate shall be exempt from real property taxes. Simplified Import – Export Procedures (Electronic Import Permit System and Automated Export Documentation System). Non-resident Foreign Nationals may be employed by PEZA-registered Economic Zone Enterprises in supervisory, technical or advisory positions. Special Non-Immigrant Visa with Multiple Entry Privileges for the following non-resident Foreign Nationals in a PEZA-registered Economic Zone Enterprise : Investor/s, officers, and employees in supervisory, technical or advisory position, and their spouses and unmarried children under twenty-one years of age. PEZA extends Visa Facilitation Assistance to foreign nationals their spouses and dependents. What are the criteria to become a PEZA company? One of the main criteria is that your company needs to be an export based company and to be considered that, 60% or more of your company revenue must be derived from overseas. PEZA requires eligible company to submit monthly reports to verify this and secondly your company needs to be located in a PEZA designated building or area. How often does a Corporation needs to submit their income statement to the government for compliance reason? Corporations are required to file quarterly income tax returns (and pay the corresponding tax therefor) together with an accompanying financial statements including an Income Statement. Monthly VAT returns will require a supporting schedule of income and expenses. Can I incorporate a Philippines corporation without stopping foot in the Philippines? Yes, this is possible with our service. We will be couriering you some documents for you to sign and you will need to get it notarized in your country and notarized by the Philippine Embassy nearest to you, and send it back to us. The process is pretty straight forward but it may just cost a bit more for the courier fee and notarization. Do I need to be present in the Bank to open a bank account? Yes, you need to be present in front of the bank manager to open your bank account. However, the incorporators may appoint a treasurer-in-trust, who must be resident, to open up a bank account in trust for the company that is in the process of incorporation. How can I be sure that my remittance of US$200,000 will be safe? We can arrange to open an account in a minimum amount in the name of the company then the remittance will be sent to the name of the company being registered. No one can withdraw the funds without the written permission of the board of the company. Should the company incorporation process fail or be denied for any reason after I deposit the US200,000, how certain am I to be able to withdraw the money with any hindrance and also to repatriate the money without any unnecessary fees or taxes? It will not happen because we pre-process all application for incorporation and check for legal implications to make sure the company being set up is allowable. If its not allowable we will not advise you to remit funds. I understand that there must be a minimum of 5 shareholders in a Corporation. How many of them must be a Filipino citizen? And can this person be living abroad? To set up a corporation, you will need to have at least 5 incorporators majority of them must be resident. If setting up a 100% foreign corporation majority can be foreigners and at least one (1) local Filipino resident. How many types of withholding taxes are there? There is (1) Withholding tax on Compensation, (2) Expanded Withholding Tax, (3) Final Tax, and (4) Fringe Benefit Tax. Is there any implications if most of my shareholders or incorporators reside outside the Philippines? Can a President of a corporation be the treasurer at the same time? No, this is an express prohibition under the Philippine Corporation Code. The obvious reason is conflict of interest. What is the role of Corporate Secretary? The corporate secretary by law is the keeper of the company records. He/She certifies all documents being issued and released by the company. How often there will Board Resolution? As long as there is a board meeting and a resolution. Do we need to conduct monthly Board Meeting? What if we are all abroad or outside the Philippines? No, you don’t need to. Meeting can be conducted off site and resolution could be achieve by a Circular Resolution. If I send document to one of the directors residing outside Philippines for signature, how is the process? It needs to be stamped and authenticated by the Philippine Embassy of his/her country residing at present. How can you categorize if a corporation is a local or foreign corporation? Is there any differences with government fees need to pay? The only difference is as Foreign Corporation, you need to have a much higher Paid Up capital which will result higher Document Stamped Tax and a higher Filing Fee for Article of Incorporation. I am not in the Philippines, but I would like to start my company registration, can you help me to have an office in the Philippines? Certainly, we can assist you for a suitable office in the Philippines depending on your choice of location. We can also provide you a virtual office packages based on your needs, so that you can use prestigious business address right away for your company registration as well as communication line. Step 1 – Early bird catches worm, thus, go to the PRC (Professional Regulation Commission) main building early to avoid the long line. However, given the organize renewal procedure, I bet the long line is not a problem anymore. I entered the PRC main building at around 9AM. For those who are not familiar with Manila area, you can check google map. Anyhow, what’s important is if you see these streets you are on the right track. Step 2 – After entering the PRC building, go straight to the Public Assistance Counter and get application form. Other blog sites , specially the old postings, will require you to go straight to window Q or R to get a renewal form. In my case, the form is already available at the Public Assistance Counter. Oh yes, this just July 2016 and purely fresh. Please take note, application form provided by PRC is all good whether its for renewal, duplicate or original IDs. By the way, before I forget, please bring passport size picture with name tag (your name and take note your real name not FB name, okay). But don’t worry, if you fail to bring one, you can always go to those photo booth in and outside of the PRC building to take care of your problem. The cost of ID picture is about Php60.00, others is at the range of Php80.00 – Php100.00. Make sure to look good in your picture, yep, the same picture will be used on your new PRC license. Attach the ID picture and fill out the form and your ready to go to the next step. Step 3 – Go inside the PRC building and proceed to window 27, which is located at the ground floor. Submit the application form including your expired PRC license to window 27 for assessment . The cost of renewal depends on your profession and years of non-renewal. Mine, being a CPA and my PRC licence is valid until 2013, I paid Php1,000.00 for the cost of renewal. Thus, the Php1,000.00 is good for 2013 to 2016. Step 4 – Next wait for your name to be called at window 31 and receive your assessment. Now, this is the part your getting excited because you already spent hours of waiting and you wanted to get a hold na of your new PRC license ID. But don’t worry, its just an hour or two from the time you entered the PRC building. Really, no exaggeration, I admire this new procedure, its kinda swift now. Oh, there, after an hour or so your name was called and its now pay time. Step 5 – Proceed to the cashier and pay the necessary renewal fee. The fee you will pay is the amount provided by the assessment in window 31. The cashier will issue Official Receipt for the amount you paid. Payment will take a lil more than minutes for there are four windows accommodating and receiving payments. Step 6 – After paying the necessary fee, proceed to window 22 and present your Official Receipt for printing of your PRC license. The assigned staff will tell you what time your PRC ID will be available for pick up. Mine, I was told to go back 2Pm of the same day. At this time, its close to 12 noon of processing and waiting. This is based on my experience. Eventually, you will notice your stomach is already complaining, this is the right time to get a break and have lunch or eat something to fill in that empty stomach while waiting. Perhaps for those applicant who arrived past 12 noon or so, the availability of their PRC ID is on the next working day. Step 7 – Remember to come back on the time set to pick up your PRC ID. But of course you can always come back at a later time or day, but why wait, remember you are so excited na to get a hold of your new PRC License ID. And by the way, this is the last step. Present your OR and sign the log sheet to signify acknowledgment of your new PRC ID and viola your ID is now yours! So there… easy as one, two, three! Renewed! Taxation, in general, is not that popular with most small & medium business owners. The same scenario exists for those professionals who wanted to practice their chosen profession such as doctor. Perhaps because most of the time, taxation is synonymous with a reduction to the overall profitability of a certain business. However, Taxation is a MUST particularly if you wanted to start a business. Last May 30, 2015, I conducted a seminar entitled “Taxation for Professionals” at the Bayview Park Hotel in Manila organized by True Wellness Warriors. The seminar was specifically intended for doctors who wanted to practice profession and of course doctors who wanted to venture into business such as clinic and the like. The topics I prepared are basically about BIR registration, invoicing compliance, bookkeeping requirements, tax computation, penalties, interest & surcharges, and important dates. Yep, it’s practically an ultimate guide for professionals who wanted to become self-employed and yes starting a business too. Whew! the question and answer portion is the most exciting portion of the seminar. Anyhow, since I already caught your attention and you are now browsing through and reading this article, I would like to share you the requirements first before we go to the step-by-step procedures, okay? Okay, if you are a professional, a doctor, lawyer or an accountant, here are the requirements that you need to accomplish. 9. Affidavit indicating the rates, manner of billings, and the factors considered in determining service fees (as specified in BIR Revenue Regulation 4-2014). You can download a sample affidavit here. After securing all those requirements mentioned, here is what you need to do next. Step 4 – Apply for Invoices/Receipts using BIR FORM no. 1906 – Authority to Print (ATP). Release of ATP is usually 3-5 working days. There. Simple, yes? Congratulations, you can now start becoming a self-employed professional. Good luck! Why you need an Accountant? Almost always business owners, particularly those who are managing small businesses and those under SME category, disregards to see the importance of having accountants. Oftentimes, they look for an Accountant when it’s already too late or worst the BIR had issued a letter of notice (LN) or letter of authority (LOA) for their business. As an Accountant, we understand that small business owners find it costly to maintain a retainer to do the monthly bookkeeping and tax preparation for their business. But what they don’t realize is the monetary and non-monetary benefits of maintaining one. The following will explain the importance of accountant in your business, no matter how big or small it is. 1. Organized Record of Financial Data. Most business owners want to focus their time and energy operating and growing their business. As such, their financial documents for personal and business often mixed up. Having an unorganized financial documents create stress and headaches to business owners because they don’t know exactly what is happening in terms of financial standing. First, accountants maintain an organized record and filing of business day to day financial records. This is often referred to as Bookkeeping. When the business has a systematized and organized record keeping of business transactions, it will save you time worrying about whether your business is on the profit side or losing end. Also, you don’t need to worry on how to organize all the receipts you need to file and record. 2. BIR Tax Compliance and Other Reportorial Requirements. All income earners are required to pay monthly taxes, even small business owners. Yep, as a general rule, everything is taxable. As such, not having an accountant means you have to understand Taxation law of the Philippines in order to be tax compliant. Thus, this is another importance why you need an accountant. 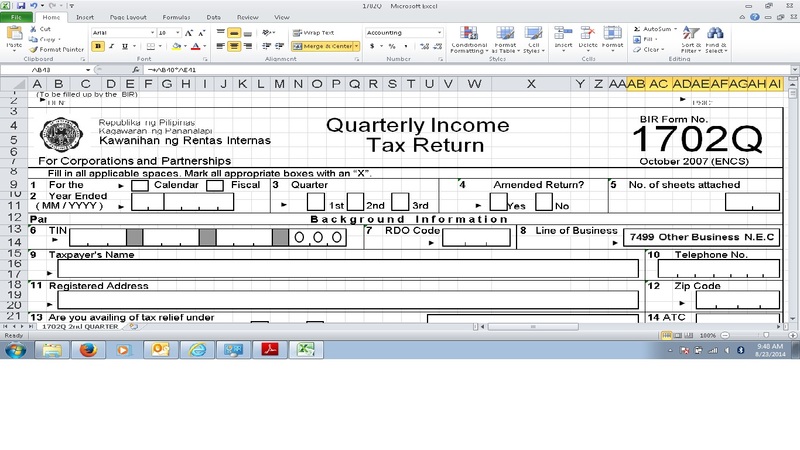 Seemingly, an accountant can compute and prepare BIR Tax Returns for you. It will save you time in studying tax law and computing your own tax return. Further, accountants can also give advice on effective tax management. 3. Save Time to Focus on Growth of Business. Keeping track of your financial data, recording and filing it can be time consuming, especially if you are not used to it. If you have an accountant, you can save a lot of time to focus on growing your business instead of worrying about tax deadlines and keeping an organized accounting records. 4. Save Money. When you don’t have an Accountant, there will be high possibility of future penalties, plus interest, on government reports you missed filing or incorrectly filed. Having an accountant can save you cost on these future penalties and charges of correcting your accounting books and tax returns on time. 5. Peace of Mind. The last but not least importance of an accountant in business is for owners to have peace of mind. When you have an accountant who does the record keeping and tax compliance, you don’t need to worry that if somebody comes to your business to do Audit. You are somehow confident that you have records to show you are complying with accounting and government reportorial requirements.